Pathologically, obstruction of the portal vein ( portal venous obstruction ) may lead to increased in the use of the collateral veins of the portal - systemic anstomoses. This will lead to formation of the varices of the rectal vein, submucosal vein of the esophagus and paraumbilical inferior epigastric vein. The increased in the pressure of the portal vein may lead to ascites due to collection of fluid in the peritoneal cavity as a result of decreased resorption of the capillary fluid. Portal hypertension is treated with sclerotherapy or band ligation in case of variceal bleeding, splenectomy in splenic vein thrombosis which caused portal hypertension and for portal vein thrombosis consider anticoagulation. 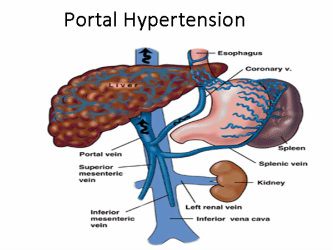 The causes of portal hypertension may include intrahepatic portal venous obstruction such as schistosomiasis, metastatic tumor and cirrhosis, prehepatic portal venous obstruction due to obstruction of the splenic vein and portal vein thrombosis. Budd Chiari syndrome, congestive heart failure, tricuspid regurgitation and constrictive pericarditis are associated with posthepatic portal venous obstruction. Patient with portal hypertension may present with signs and symptoms such as ascites, varicose vein of the periumbilical ( caput medusa), hypotension , varices of the esophagus, hematemesis, splenomegaly, hemorrhoids, spider angioma and pallor. 1.J, Bosch, Pizcueta P, Feu F, Fernández M, and García-Pagán Jc. “Pathophysiology of Portal Hypertension.” Gastroenterology Clinics of North America 21, no. 1 (March 1992): 1–14. 2.Bosch, Jaime, and Juan Carlos García-Pagán. “Complications of Cirrhosis. I. Portal Hypertension.” Journal of Hepatology 32, Supplement 1 (2000): 141–156. doi:10.1016/S0168-8278(00)80422-5.